Everyone has a different take on the Lada Niva. To some they are outdated junk that is more fodder for comedy than anything else while others revel in their obscurity and love their unique design. 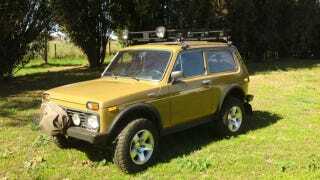 One thing is certain about the Lada Niva—examples like this one currently on Ebay are exceptionally rare in the United States. You can say a lot of things about the Lada Niva, but there are certainly few other vehicles in the world like it. The mini 4x4's are everywhere in Russia and Eastern Europe but very few have ever made it to the United States. Unfortunately no explanation for how this USSR built vehicle ended up in California is included in the auction listing. However this Niva ended up here it appears to be in very good condition, ready for any instantly weird task you decide to complete in the 4x4. The engine was replaced with a 1981 Fiat Spider DOHC 4 cylinder with Bosch fuel injection for more power and increased parts availibility in the US (It's currently running "slightly hot"). If that statement doesn't scare you off from purchasing this Niva, we aren't sure anything will. If you're still willing the undertake the inevitable project car hell that awaits the new owner of this Niva the opening bid is $6,000 with over 5 days left on the auction. Hat tip to Ex. President Mack41!